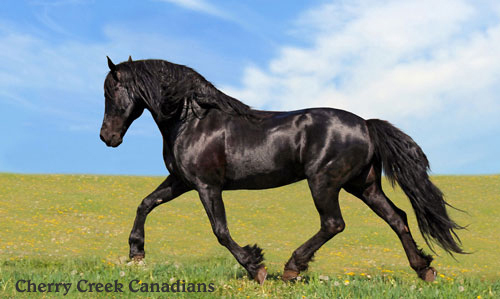 Our first and foremost love is for the Canadian Horse, a breed that we discovered in 1994. 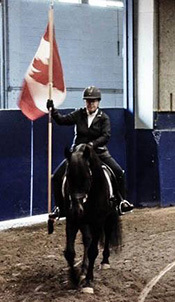 We have now been breeding Canadian Horses for nearly 20 years and take pride in our breeding program which has produced a number of very beloved, athletic, versatile, and quality horses all over Canada and the USA. In 2004, we decided to branch out and started raising Canada's heritage chicken variety, the Chantecler. In 2009, we added Ridley Bronze turkeys, another endangered uniquely Canadian heritage variety. There is lots of information here, so feel free to take your time and enjoy browsing. We are constantly in the process of updating our website so be sure to check back frequently! All three are being offered for sale. For more information on them, please contact us. We had a lovely filly by Fonzie, out of our mare Fancy, on April 30th. Her name is Cherry Creek Fonzie Electra. She is being kept by us. 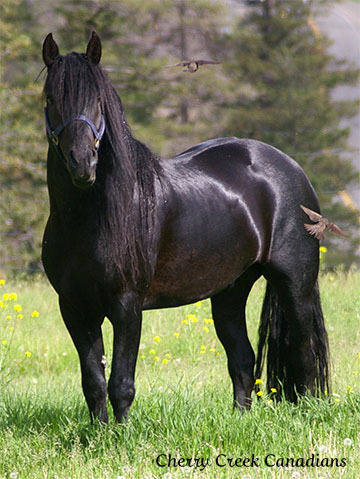 Our stallion Merit was chosen as the model for the Breyer Canadian Horse. See Merit's page for more details. 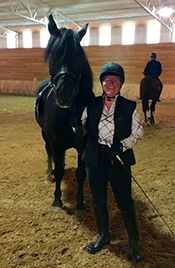 During 2015, our stallion Merit had a busy year showing at dressage shows throughout the interior. In October we had the absolute honor and pleasure of participating in a clinic with FEI judge and superb coach, Stephen Clarke. Merit also appeared at the CHHAPS PNE Canadian Horse Extravaganza held in celebration of the 350th year anniversary of the Canadian Horse in Canada.